In any hospital with a busy acute and elective surgical service, complications associated with a patient’s postoperative recovery account for a significant number of requests for acute imaging. These requests also account for an increasing proportion of the workload for radiologists providing an on-call service, who have varying degrees of expertise in gastrointestinal imaging. It is therefore important for radiologists who are asked to report these studies to be familiar with the postoperative anatomy of the more commonly encountered surgical procedures and their potential complications. 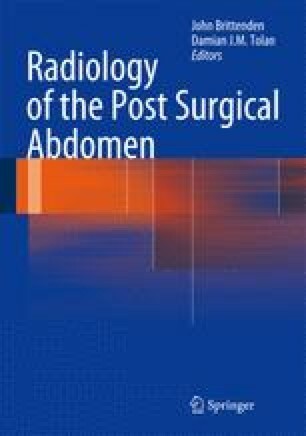 This chapter aims to address the basics of postoperative imaging, with an emphasis on CT, and give an overview of what might be encountered in the postsurgical abdomen. Specific surgical techniques and the radiological changes they produce will be addressed in subsequent dedicated chapters.